How long does it take to reglaze a bathtub? When can it be used? It usually takes between 2 to 4 hours to refinish a tub, depending on its type, size, condition and if it has been previously refinished. If the bathtub has been refinished before, it would need to be stripped (the old paint removed) before it’s reglazed and this may increase the time significantly. However, the tub will be done in less than a day and be ready to be used 24 hours later. Is there an odour when reglazing a bathtub? Most of the chemicals and paints that we use to reglaze bathtubs contain solvents that give off a paint-like odour. These solvents are very important as they help make the glaze set and dry properly, while leaving the bathtub with a glossy shine. Dr. Tub’s reglazers use industrial ventilation systems to divert the fumes from your bathroom to the outside. We suggest that you keep the bathroom window and door closed for the first 24 hours to ensure no pollen or dust enter the bathroom, land on the tub, and affect the final feel and look. Dr. Tubs recommends that you open other windows outside the bathroom on the same floor to air-out the area. Any fumes will dissipate within time. After 24 hours, you can open up the bathroom door and window to air out the bathroom. In addition, children, pregnant women, anyone with asthma or sensitivities and pets should not be present during the reglazing process, or at the very least, not on the same floor. Do you reglaze claw foot tubs? What about fibreglass tubs or Jacuzzis? 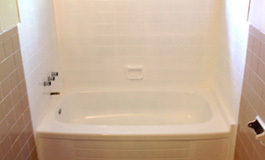 Dr. Tubs Reglazers are trained to reglaze all types of tubs. Whether you have an old antique claw foot tub, cast iron art deco bathtub, steel, acrylic or fibreglass bath, we can reglaze them all for you. The only bathtubs Dr. Tubs Reglazing doesn’t refinish are Jacuzzis. There are three issues with resurfacing Jacuzzi tubs, 1) the jets, 2) the bubble maker and 3) the cost to refinish. With regards to the jets, there are two types of jets, plastic ones and metals ones. If they are plastic, they can be sprayed, but their position will become fixed and if they are moved, the paint will crack. If they are not sprayed, they will stand out like the bubble maker, being a different colour than the rest of the tub. If you have metal jets, they can be cleaned and masked off. Not all Jacuzzi’s have a bubble maker, but if there is one, spraying it will clog up the holes rendering it useless. If we mask (cover-up) the bubble maker, it will have a different colour than the rest of the tub after refinishing and it will stand out. The cost to refinish a Jacuzzi depends on the size, the shape and if it needs to be stripped before refinishing it. Home Jacuzzis that don’t require any special preparation, such as stripping, tend to cost between $750-900, but can go up to as high as $2000. How does reglazing a tub compare with a bathtub liner? Bathtub liners are at least four times as expensive and can take several weeks from the time they are ordered to the time they are installed. Bath liners come in two types – fibreglass and acrylic. The fibreglass type is the cheapest and it’s also the easiest to break. The acrylic type is stronger, but can also break. Regardless of the type, if it gets cracked or chipped, the entire liner must be replaced. This is usually more costly than the initial installation as it is difficult to remove it from the tub below, leading to more expenses. Bathtub reglazing is the better option, as it costs less, takes a few hours to do, and you’ll be using your tub in no time. If there is ever an issue, it can be fixed with a touch-up. Do refinished or reglazed tubs look painted? You should never be able to tell if the tub your bathing in was reglazed before. If you can tell that it was painted outside of a manufacturing facility, it wasn’t done right. Call Dr. Tubs Reglazing at 416-630-9143 . Does Dr. Tubs Reglazing do anything else other than refinish tubs? Yes! Dr. Tubs can brighten your entire bathroom by reglazing your sinks and wall tiles. Please note that not all sinks can or should be reglazed. Please call us to discuss or email pictures to info@bathtubrefinishingtoronto.ca. All labour and materials needed to refinish your tub. Our service also includes removing the old caulking around the tub and replacing it with new silicone caulking. Chip repairs may be included in the price. How do I take care of my newly reglazed tub? Can I use Vim or a cleanser with bleach? These are very important questions. After reglazing the bathtub, make sure that no water, dust, pet hair or anything else touches the reglazed surface for the first 24 hours, as it requires this time to dry and set. After 24 hours, it can safely be used. If there is any masking paper around the tub or tape over the drain, it can be slowly removed. Don’t rip it off as it may pull off the caulking. The overflow cap can now be carefully screwed back on. Make sure not to crack or chip any of the bath’s surface, as it may still need some time to fully cure. It should be cleaned at least once a week with a soft cotton or microfiber cloth. Always use a non-abrasive cleaner like Mr. Clean, Dawn dish soap, Sunlight, Fantastic, Lysol bathroom, Palmolive or any natural bathroom or kitchen cleaner. Green Works or mild soaps are great. Make sure bleach, or abrasive cleansers like Ajax, Comet or Vim, are never used. They will ruin the finish, turning the surface yellow and causing it to chip or peel. Likewise, never use any abrasive cleaning pads, scrubbing brushes or old, dried out sponges, as they will also ruin the surface. Lastly, keep bottles, soap and mats off the tub as they can damage the reglazed surface. What type of paints does Dr. Tubs use? Are they toxic? Is it safe for my child to bathe in the tub after you refinish it? Dr. Tubs has always used epoxy paints for the primer coats and acrylic polymers for the topcoats. They are made for this application and are therefore safe for homes, like yours. Our products are lead, melamine, iso-cyanate and BPA free. This means you and your child can enjoy bathing in your newly reglazed bathtub. Dr. Tubs Reglazing has always used the combination of an epoxy primer with an acrylic topcoat. The reason is that epoxies are great, but they’ll yellow over time. Coating an epoxy with an acrylic polymer will seal the epoxy in preventing it from turning yellow, keeping your tub looking white and shiny. Can I use a mat to prevent slipping in my newly refinished tub? Mats should never be used on a reglazed tub, especially mats that have suction cups as they will rip off the glaze 100% of the time. Mats without suction cups don’t stick very well and they will likely damage the glaze over time. Dr. Tubs Reglazing has a special no-slip system that we recommend for everyone, whether you use a mat or not. It is built into the primer coats so it looks shiny, non-gritty and is completely part of the glaze. The no-slip system doesn’t look cheap and costs approximately $40. It’s well worth the investment and it will make the tub look great and safe. Frequently asked questions on a claw foot tub reglaze, bathtub refinishing, bathtub liner, bathtub caulk, tile resurfacing and more.